Was privileged to be asked to be involved in this. 29 creative’s were asked by WWF, Do The Green Thing & Pentagram to create a poster for Earth Hour to be released every day through March 2014. Others in the 29 include Sir Paul Smith, Sir Quentin Blake, Rankin, Wieden & Kennedy, Neville Brody & Pentagram partners. 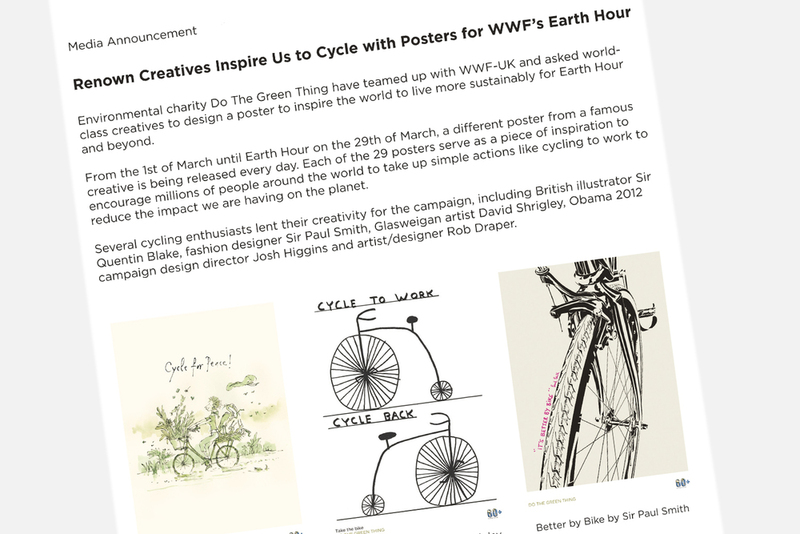 Each poster is distributed to 50million people daily throughout the WWF & Do The Green Thing community, Posters are printed on FSC paper with sustainable ink for £12 with all proceeds going back to the Do The Green Thing charity. Hand painted lettering onto wood behind my daily communting bike.